Like the plot of your favorite TV show, the best burgers have layers. Cheese is the clingy sidekick who seems to always be a little extra; lettuce is the dependable friend; tomato is the divisive character you either love or hate; and onion is thrown in for comic relief. But everyone is really there for the star – the tender, flavorful beef patty – the ingredient that creates the magic between the buns. If this overstretched metaphor has you excited, then you’re probably also salivating in anticipation for National Hamburger Day on May 28. 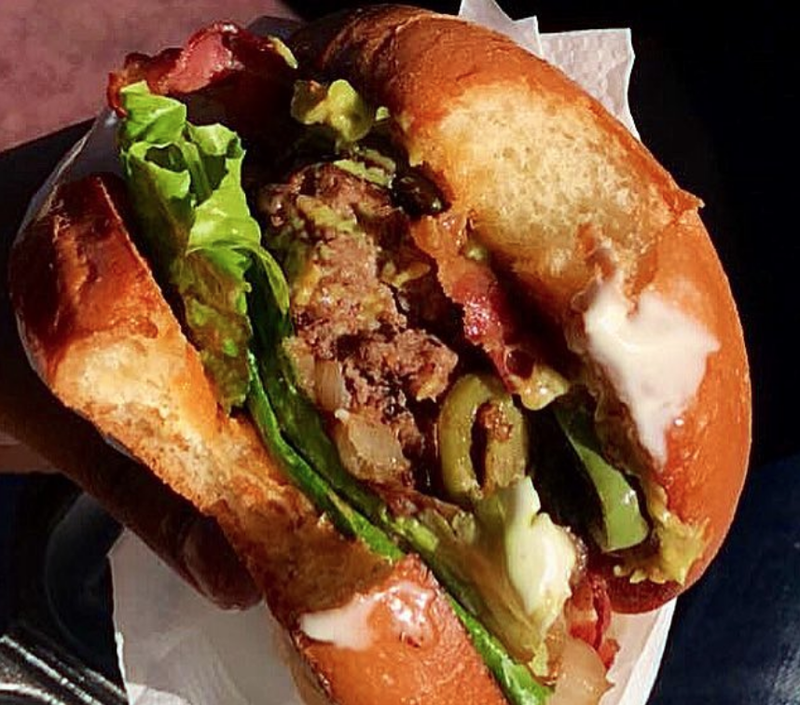 To prepare you, we’ve rounded up the best spots in LA and Orange County to tuck into a phenomenal burger. At 4th Street Market’s GRAZE, the lineup of sauces will draw you in and the short rib, brisket and chuck meat will send your taste buds into a frenzy. Truffle aioli, bourbon BBQ and the proprietary Graze sauce are each mouthwatering in their own right, but the tequila aioli on the spicy, south of the border style Agave burger stands alone in its deliciousness. Pepper Jack, arugula, tomato, red onion and grilled jalapeños put the finishing heat on this masterpiece. The Pinoy burger is a standout at TRADE food hall in Irvine, blending Filipino cuisine with traditional comfort food. The patty is comprised of longaniza (like chorizo in the Philippines) and ground Angus. Add in sharp cheddar, caramelized onions, mixed greens, banana ketchup (an island staple) and the toasted brioche buns can barely contain the goodness. We suggest two hands for this one. 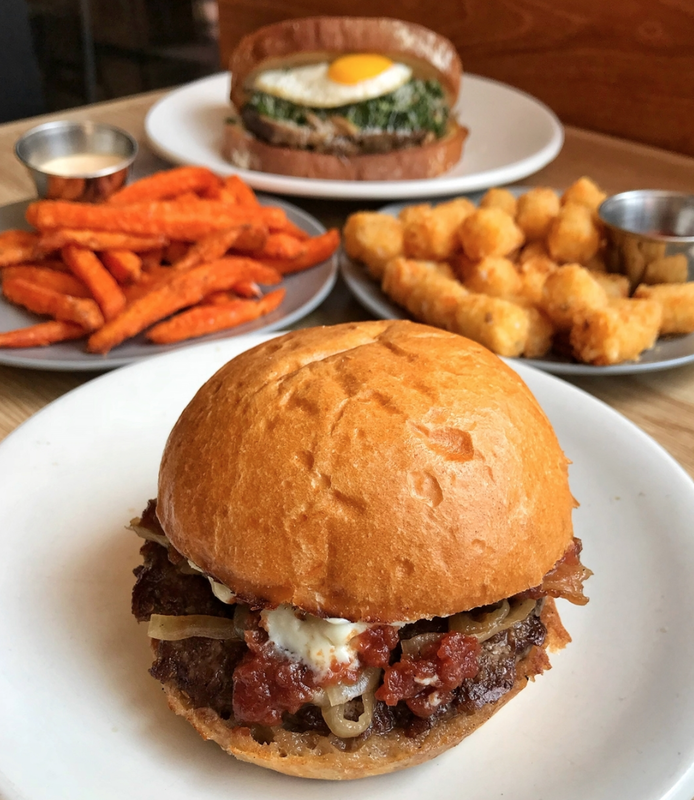 From humble but beloved food truck beginnings, The Cut Handcrafted Burgers has expanded to their first brick and mortar space in Irvine’s Westpark Plaza, delivering chef-driven recipes made from scratch. Devouring a burger can be a tad animalistic, so for the sake of refinement, try out the Classy, a creation that plays goat cheese off of balsamic glaze and honey. If debauchery is just too enticing, pair it with a dirty martini, or any one of their craft cocktails. The ocean view is incredible from this restaurant in Huntington Beach’s trendy shopping mall Pacific City. Palm trees waving in the breeze set the scene for the scrumptious Cali Bird: pepper jack cheese, bacon, mashed avocado, lettuce, tomato, red onions, pickles, thousand island and you guessed it, grilled chicken – because chickens are burgers too! In the spirit of equality, Portobello or the 100% vegan Impossible patty can be subbed for a meat-free burger celebration. Reading the menu at Cassel’s, there’s no need to fret over the frivolities of eccentric toppings; stick with the classic cheeseburger and you won’t be disappointed. It comes with all the regular fixings served on a Portuguese bun and demands an order of fries and a chocolate malt shake. Exquisite. Cooked-to-perfection. Timeless. Are you feeling blue that there’s only one burger on the menu at Father’s Office? The sadness will disappear when you take a bite of The Office Burger®, loaded with caramelized onions, Applewood bacon, Gruyère, Maytag blue cheese and arugula. It’s hard to wrap your mind around this one, much less your hands, and this whopping sandwich packs a savory punch with the sweet onion fig jam, not listed on the menu. The highly touted item brings people from all around to its locations in Santa Monica and Culver City, and Angelenos will soon be able to enjoy a Downtown venue. The Plan Check brand stems from its original location next to LA’s Building and Safety Department, where architects, designers and engineers would flock to have their building plans approved. Today, the innovative, creative lifestyle lives on in their meticulous burger constructions. On the Plan Check Burger, you’ll find Americanized dashi cheese, with elements of Japanese ingredients kombu (kelp) and katsuobushi (dried, fermented tuna), schmaltz onions, mixed pickles on a crunch bun. The pièce de résistance is the trademarked Ketchup Leather, a dehydrated square of tomato paste that imparts a similar flavor sans the sogginess. Hinano Cafe has been serving tasty burgers and ice cold brews on the Venice Boardwalk since 1962. Even The Doors’ Jim Morrison was a fan, stopping by whenever he was in the area. For a local bar, Hinano has a welcoming, surfer vibe, with pool tables, a jukebox and free popcorn. Visitors to this institution can revel in the World Famous Hinano Cheeseburger, served with the usual veggies, mayo, mustard and relish on an airy sesame seed egg bun. Extras such as chili or a hot link make for a memorably meaty experience. At HopDoddy, beer and burgers are king, especially among their Brew Burger Series. Each month, the eatery features an ingredient prepared with a local craft beer from the rotating Brewer of the Month. The Elvis for example, includes Applewood smoked bacon, IPA infused peanut butter, Tillamook cheddar, Angus beef and bananas. Ohhh mama! While the changing specials keep things fresh and surprising, the mainstays are just as good. Highlights of the Magic Shroom are field mushrooms, goat cheese and basil pesto; Buffalo Bill rocks Frank’s Hot Sauce and blue jack cheese. Washing them down with a frosty pint is the logical next step. National Hamburger Day should be a dawn to dusk affair, so start it right with the signature HashTag Burger. The half-pound ground beef patty stacked with cheddar, bacon, crispy hashbrowns and one fried egg on a sweet brochette bun will check all the boxes for the most important meal of the day. The roasted garlic aioli makes it suitable grub for any time. As the name implies, it’s absolutely deserving of some social media love. Have no shame in feeding the camera first.